In daily life, many an Executive Director would love to have every task done by staff or hired out. What if you as executive decide to take on the challenge of designing your organizations’ Annual Report? Don’t you think it a good challenge and may be a worthy saving to the organization such that the USD400 you had budgeted for that item remains in the organizations coffers? Don’t you imagine that such an input makes you a better manager? Think about it. At least on my part, designing such is not something I would hire out as there is no challenge in the process of production that I cannot face head-on. What is your take when you look at the work below? Museveni’s Government is threatened by public gatherings. The way people were attracted and made contributions to the ‘people’s parliaments’ (bimeeza) that were checked after the Buganda Riots is a good for reference. However, common sense dictates that when there are ills that people suffer from, it is best to give them avenue to address those ills such that you in authority make effort to address them. But suppressing them because you have created a police state will with time lead to an explosive situation, which the NRM Government would avoid. A new Bill which seeks to outlaw the use of megaphones, loudspeakers, loud hailer and public address apparatus except with a written permission of the Inspector General of Police or an authorized officer has been tabled before Parliament. The Public Order Management Bill 2011 tabled in parliament on Tuesday outlaws all apparatus whether artificial or not used for amplifying, broadcasting or reproducing any music or speech or any other sound within in Uganda. "A person shall not, in a public place or so as to be a public nuisance use megaphones, loudspeaker...," the Bill reads in part. This will greatly affect street preachers, music and movie sellers and people announcing concerts around the country who have been using megaphones and public address systems on trucks to woo customers. The Bill describes a public place as "Highway, public park or garden, public bridge, road lane, footway, square, court, alley or passage and any open space to which, for the time being, the public have or are permitted to have access by payment or otherwise." The minister has powers to declare any place a gazetted area "if the minister is of the opinion that it is desirable in the interests of public tranquility." If a place is declared a gazetted area, then it will be unlawful for any person to convene a public meeting at which more than 25 persons will be present unless a permit has been obtained by the organizer. Other provisions in the Bill include; All Public meetings ending by 6.00pm while no meeting can start before 6.00am, the Event organizers providing a steward for every 50 demonstrators or participants in a public meeting. "They must ensure that all participants are unarmed and peaceful; undertake to compensate any part or person that may suffer loss or damage from any fall out of the public meeting," the Bill states. Event organizers who fail to comply with the above requirements may face up to two years in jail. The Bill also requires organisers to give a seven day notice in writing to the Inspector General of Police (IGP) of their intention to hold a public meeting. The notice however should not exceed 15days before the proposed date of the public meeting. In the notice, the organiser must state their full name, physical and postal address and their immediate contact. Other requirements are the proposed site for the meeting, the estimated number of persons expected, and the purpose of the meeting. The Bill was tabled by James Baba, the state minister of internal affairs who said it is aimed at prescribing measures for safeguarding public order without compromising the principles of democracy, freedom of association and freedom of speech. "The inspector General of Police will have the power to direct the conduct of public meetings subject to the law," Baba said. Speaker Rebecca Kadaga committed the Bill to the Committee of Public Service and Local Government for scrutiny. "Let the committee peruse and report back to the House within 45 days," Kadaga directed. However, the Bill does not restrict "public meetings held wholly inside a building or convened in good faith for; religious observance, by the government or administration of a district, primarily for sports purposes or for any other social event including a funeral, wedding or party." The Bill makes it incumbent upon an authorised officer to give notice within 48 hours after receipt of the notice to hold a public meeting to the organiser that it is not possible to hold the proposed public meeting. Some of the grounds under which a public meeting may not be held are; if notice of another public meeting on the date, at the same time and venue proposed has been received, or if the venue is considered unsuitable for the purposes of crowd and traffic control or will interfere with other lawful business. However, the Bill provides that in case a person is aggrieved by the decision of the authorised officer he or she may appeal within 14 days to the IGP and if they are still not satisfied with the IGP's explanation then they can appeal to High Court within 30 days. The Bill gives as duties of a police officer; provision of security to both participants and members of public, assessing the risks of the meeting, identifying a traffic plan for both vehicles and humans and dispersing defiant or unruly crowds at a public meeting "where the police officer has reasonable grounds to believe that a breach of peace is likely to occur..., in order to prevent violence, restore order and preserve peace." The Bill restricts the use of fire arms by the police officer to only when in self defence against imminent threat of death or injury, or in defence of others. He or she may use firearms when arresting a person presenting danger, and resisting the officer's authority. The Bill also states five restricted areas in which no public meeting must take place unless with the permission of an authorised officer. They are; Parliament and its precincts, State House Entebbe, State lodges countrywide, International airports and Courts of Judicature. The report was presented by Minister of Finance, Miria Kiwanuka before the August House in accordance with the provisions of Section 1 of the Budget Act and presents information relating to the new external financing undertaken in (Financial Year) FY 2010.11 and the total indebtedness of Government as at 1st march, 2011. In the FY 2010/11, new loans equivalent to USD 1.174bn have been approved by Parliament, new grants worth the equivalent of USD 0.217bn have been concluded while no new guarantee has been issued. As at 1st March 2011, Government indebtedness stood at USD 4.29bn. The outstanding fiscal contingent liabilities on publically guaranteed debt is USD 155.4million. The question to ask is whether the loans borrowed will help better the situation of the people of Uganda. There is need to establish whether the borrowed funds are really improving the welfare of the people of Uganda or contributing to their impoverishment. People are impoverished as they are taxed highly to make the repayments, yet there may not be evidence that borrowed funds were actually channeled to benefit the people, as there are a number of cases reported on where funds have been diverted. 2ndly, it is incumbent on the NRM Government to get a difference between party funds and funds procured to help all the people of Uganda. It will be great if the NRM can meet this objective as there are instances cited where the beneficiaries to some of these monies are party supporters; which is a criminal act. As long as it can be proven beyond reasonable doubt that Amama Mbabazi is caused financial loss to the people of Uganda for his personal gain, there is no way he can be safe. He may see himself second to god in Uganda, but that does not exonerate him. Be it today or after, he has to face the law. This business of using office, feeling to be so high can be used with a short lived cushion as long as the NRM reigns, but Mbabazi MUST know that as long as he has a case to answer, he will have to face the law, and if there are any recoveries to be made, he will or his estate will meet them. There is need to cultivate a culture of being responsible. Who can witch hunt a person who is clean? Some people see themselves on earth as long as the NRM under Museveni is in control, but this caliber of people are advised to better do business the right way. No body will go away with the money of the people of Uganda and imagine he will not pay back. Ugandans have to recover from whoever steals their money as long as it can be proved that he did. Period. The Committee was informed that by the time of audit, the total funding allocated and released to the Ministry to cater for CHOGM activities amounted to Shs.4,869,892,986. An amount of Shs.130,282,210 was however still on the bank Account as at 31st January, 2008. • The Committee, however found that the Ministry of ICT had spent an extra US$5,000,000 outside the budget approved by Parliament for CHOGM. This amount was reportedly spent on the TETRA communications systems (walkie talkie system) procured by the Ministry of ICT, but for use by the security. • The money was diverted from an ICT loan for the National Data Transmission Backbone Infrastructure Project to the Security Ministry and yet, when the loan was being approved, the walkie talkie system was not included in the loan request. • Whereas the Permanent Secretary, Ministry of Information Communication and Technology (ICT) had signed a Memorandum of Understanding with Huawei for the supply of the TETRA system at US$4,500,000, the same PS instead went ahead and released to Huawei US$5,000,000 for the equipment, including an unexplained $500,000. This therefore led to a loss of US$500,000 which cannot be accounted for. • The Committee also found that the procurement of the system under the Security Ministry was carried out without regard to the PPDA Regulations. • The Minster in charge of Security, however, took it upon himself to introduce the issue of US$5,000,000 to the President, the first time ever, the figure surfaced. Whereas the Minister explained to the Committee that he was at the tail-end of the procurement process, the Committee found out that there had been no process at all, and that the alleged process was actually his own creation. He even failed to produce any evidence in support of his argument. • Whereas in a meeting with HE the President, it was resolved that another meeting be held between HE and the Security technical Committee later, to rationalize and justify the proposal, the Minister could not table any minutes to show that such meeting ever took place, and what advice such committee had rendered. Instead, on 13th October 2006, the IGP wrote to the Minister for ICT (and copied to the Minister for Security) claiming that the security Committee had convinced the President that they should procure the TETRA system from Balton at US$5,000,000. The Committee questioned the mandate of the IGP in writing to the Minister of ICT instead of his line Minister in charge of Security, who had all along been pursuing the matter with the President. Whereas the President was mentioned in this letter, he was not copied the same letter, and instead, it was copied to the Security Minister. • The Minister also could not prove that he was not, in any way, associated with Ms Balton, its executives and staff. As such, the committee could not rule out conflict of interest on the part of the Minister. • Further Investigations on the Countries that had been supplied with the TETRA system in the last ten years do not show that Uganda was one of the beneficiaries of TETRA supplies. The Committee could therefore not ascertain whether the TETRA equipment were ever supplied at all, and if so, whether they were genuine. • While the President was concerned about the budget and source of funding for this equipment, the ICT team in the meeting informed him that there was some money under the Chinese loan for the Backbone Transmission project that could be used to procure this equipment. • The ICT Ministry took the lead as the lead procuring entity and sought clearance from the PPDA for direct procurement, which they obtained. • However, the Minister for Security, Amama Mbabazi, put aside the indicative price of US$3.2 million, for the equipment and instead informed the President that they were able to find equipment at a cost not exceeding US$5,000,000. Interestingly, when Balton was later asked to submit a bid, it submitted a bid of US$4,999,999. • This information contradicted what the Minister had earlier communicated to the Committee, that by the time he informed the President about the $5.0million estimate, the procurement process was at the tail end. But these witnesses confirmed that no procurement process had commenced at that time, at all. • The Committee also separately established that the said Ms Susan Katono is related by blood to Minister Amama Mbabazi. • Whenever Susan Katono, wrote about this procurement, she copied to Hon. Amama Mbabazi and yet Zeeudi managing Director of Balton never did so. • The Inspector General of Police (IGP) Kale Kayihura never attended the meeting of 12th September 2006, with H.E. the President where Hon. Amama Mbabazi asked for US$5,000,000 for the purchase of this equipment. It was therefore the responsibility of not Kale Kayihura but Minister Mbabazi or the Minister of Information, Communication & Technology to ask for the procurement. Unfortunately Hon. Amama Mbabazi chose to play “hide and seek” games and instead used the Inspector General of Police. • The Government of Uganda paid some US$500,000 as commission to Huwaei on a demand that was not included in the contract. The Committee found this criminal. CAN YOU IMAGINE THAT A PRIMARY TEACHER IS PAID THE EQUIVALENT OF TWO SECONDS ADVERTS ON CBS FM? It is a fact and real; the primary teacher who gets a net of shs 200,000 is paid the equivalent of the cost of 2 30 seconds advert on CBS 88.8 FM run between 6.00am and 9.00am. This is true. 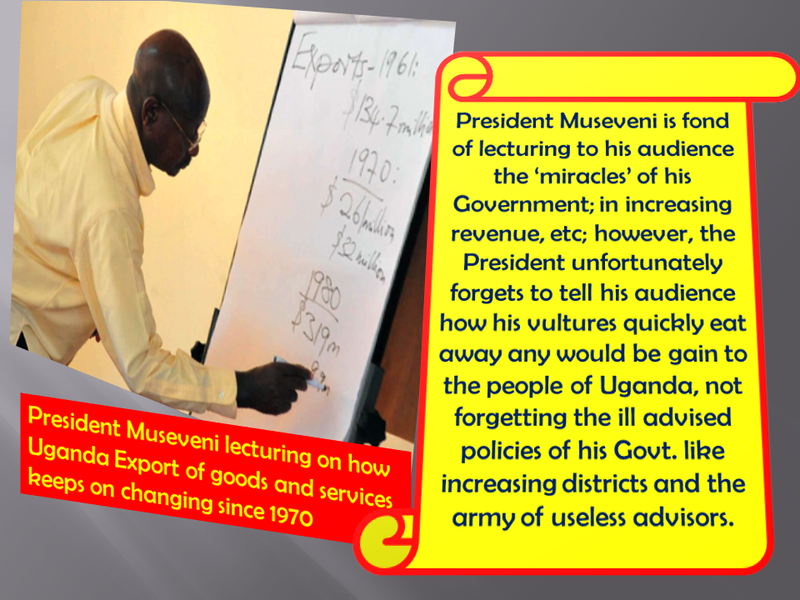 The Government of Uganda must come to ground and address the harsh economic situation it has created. In the 1960’s salary earners were kings. These people’s contribution was being rewarded. However, today, it disturbs to see that a situation has been created where it is those who exploit Ugandans that stand to benefit. Government when working on the budget of 2012/13 must address the imbalance. It is sad. 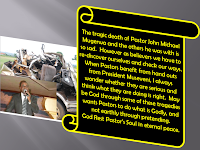 COULD PASTOR MUGERWA'S TRAGIC DEATH BE GOD'S ANGER? PASTOR JOHN MICHAEL MUGERWA'S PERSONAL TESTIMONY. Hello my friends, my name is John Michael Mugerwa. I’m happy to introduce myself to you. I was born March 3, 1961 in the jungles, and raised up in those remote places. I grew up in a Catholic family. Both of my parents were Catholic and were also raised up as Catholic. I feared God, though I didn’t know much about salvation. When I was 16 years old, I moved to the city of Kampala, which was the only city we had in Uganda to further pursue my studies. Because by then I had finished my Primary section and I needed to join the Secondary level. I came to Kampala in 1977, but I didn’t go further as far as school was concerned. I ended up dropping out having lost my father who died in 1979. It wasn’t easy for my mother to pay for my school dues. Though she struggled and tried very much, she couldn’t push me ahead for long. She only pushed me for one year, and then in 1980 I dropped out due to the lack of school fees. When I dropped out of school in 1981, I started working. I got a job washing cars and I started doing that as a source of my income. I washed cars many years, for almost 10 years from 1981 to 1991. However, in 1982 it was a Monday early in the morning, and I was on my way walking to work. One man who was a stranger to me asked me whether it was okay to join me, to walk together to town. I agreed, he joined me and we walked in company, and after we had walked for just a few meters, he asked me, “John, did you go to church yesterday?” Because it was Monday and yesterday was Sunday, so he wanted to know if I had gone to church. I told him “Yes”, and my yes was true because I had gone to church that Sunday. Then he asked me another question, “What did the priest talk about, what did he teach?” I had gone to the church, and attended only the mass, I wasn’t ready for that question, and I didn’t know much about the sermon. But this stranger wanted to know the sermon and I wasn’t able to answer that question. I tried to dodge it by trying to argue with him and say, “You don’t belong to my faith, and I don’t belong to yours, why should you like to know much about my faith?” But the fact is I was only trying to dodge him, I couldn’t answer his question. During that time we started arguing and when he saw that I was arguing even more, I don’t know how it came about, but he reached into his bag and pulled out a new bible and gave it to me. In my life I had never owned a bible so that gift simply shocked me, humbled me and I couldn’t argue with him any more. When he realized that I had been humbled, he took the advantage of preaching to me and he went ahead and to tell me that I needed to clear my life, put my life right with Jesus. Remember, we are on our way walking but he was busy preaching to me. During that time he went ahead to ask me, “John, were you baptized?” I said, “Yes.” And he asked me, “When was that?” I told him that I was baptized as an infant, but he told me, “But John, you need to know that you must believe first so that you might be baptized.” He told me to open my bible, (because by then it was my bible) to the book of Mark, chapter 16, verse 15. But I didn’t know where the book of Mark was, so he helped me and we opened to the book of Mark, and we read “Go into the whole world and preach the gospel. Whoever believes shall be baptized.” He told me I must believe first so that you might be baptized. During that sharing a light shone upon my mind and I knew I needed to believe in Jesus Christ to be my personal saviour. I told him, “I need to believe.” He was excited and he took me to the side of the road, it was a busy road. By then I was still a young man and this man led me to confess my sins and to repeat after him a confession prayer. I tried to argue with him, “Brother just give me the directions to your church, and I will come on Sunday”. But he couldn’t let me go, he wanted me to confess the sinners prayer. It was a bit of an embarrassment to me, I knew he wouldn’t let me go, and I didn’t want to disappoint him, thinking that he might even withdraw his bible from me. So I just agreed, he took me to the side of the street and I repeated after him and he told me to speak louder after him, though it was a bit of embarrassment to me, but you know I had to do it. Then after that, he told me to close my eyes though people were looking at us. Most of them knew me, and they were surprised and wondered what I was doing. It was early in the day and they were wondering what had happened to me. He couldn’t let me go and he prayed over me, this was a Pentecostal man. He just shouted in his prayer and it was a long prayer, but what could I do. Then after that it was time for him to let me go and that is when I realized he wasn’t even going to town, he was just pretending, just using it as a trap to trap people like me. But good enough, he gave me money to catch a bus so that I didn’t have to walk to town. And the balance was enough for me to get lunch and supper for that day. What a blessing I received on the same day, salvation and money. After that day, I went back home, by then I had entered into a traditional marriage with my wife Evah that happened in the same year. So I went back home and told my wife, she couldn’t believe me what happened, but it was the truth. And she told me “Okay, when you go to church on Sunday, then I will accompany you.” Sunday came and I dressed up and my wife did the same and she accompanied me and we ended up going to the church where that street preacher had directed us. We met him at the door, he introduced us to the pastor and the whole church was excited and received us with joy. When my wife saw what happened, how gladly they received us, she also surrendered her life to Christ on that day. So since then that was our turning point. We stayed in that church, the pastor loved us, together with the street preacher, they loved us and he started to disciple me. Sometimes I would join him on the streets and we would preach together and then after, I became an interpreter for my pastor. He would preach and I would interpret in Swahili, sometimes he would preach in Swahili and I would interpret in Luganda, the local language mostly spoken here in Kampala. Being an interpreter of a man of God, I became acquainted with the Holy Ghost and the Holy Ghost would deliver the message some times through me. Then, in 1984 two years after my salvation, there was an apostle in the city, his name is Alex Mitala. Together with my pastor of the local church I was attending, they planted a church in one of the slum areas of Kampala, named Katwe. This was a place full of gangs, prostitutes, thugs, bandits and people of that calibre. So, I was to take the job of pastor to that newly established church. I accepted by the grace of the Lord though I was still young in the Lord and I didn’t know much about ministry. But I accepted by the grace of the Lord and on January 31, 1984 we took over the responsibility and the work of that church. The church began with only two women, but we had to begin somewhere. It was only the might of the Lord which enabled me to stay. Just imagine, I was from a large church and now here I am beginning with only two women, that even shocked my wife and she went back to our former church. She did not like to come to my new church of only two women. But anyway, I stayed there and served those two ladies, the grace of the Lord was there and I ended up serving them and leading them what to do. One was the secretary, the other was the treasurer and I became the chairman, so the three of us were the elders. From time to time I wanted to quit, I thought that maybe this was not the right place, but spiritual fathers in the city told me to be faithful with few and the Lord would bless me with many. One time I was attending a minister’s conference and I heard one preacher talking about how faithful Jesus was with one woman at the well, and after that faithfulness, the Lord poured out the whole city to him. That message changed my thinking and I went back and decided to be faithful with the two women, but as I am speaking now I have good news. The church started growing and growing. Right now the church has grown, we have given birth to many sister churches. I have many spiritual sons and have shown them how to plant churches around the nation. The church I started with is still growing and now if you visit us on Sunday morning you will see about 800 people and in the evening service you would see about 2,000 people. So God has just been taking us from glory to glory time after time. That is how the church has been growing, and the Lord has blessed us in that area. To take you back, remember I had married my wife in 1982 the traditional way. We decided to renew our marriage vows in 1985, and that was a great blessing. As I am speaking right now, the Lord has blessed us so much, as I have told you. Our church has existed for 20 years and we have given birth to over 20 sister churches, and our church has grown to 2,000 people and the Lord continues to bless us. We constructed a church building which accommodated us for seven years, but we outgrew the building and the Lord gave us an additional piece of property. There we have set up a temporary shelter and by the year 2005 we will commence the work of constructing a new church building. 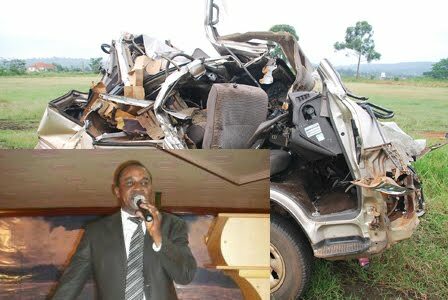 Pastor Mike Mugerwa of Saints Gate Pentecostal Church in Makidye died on spot in a motor accident along the Jinja-Iganga highway on Thursday. The accident occurred at 7pm in Kakira when two trucks and a super custom all traveling from Iganga knocked each other. Another Ugandan and three whites also died on the spot. Paul Mwerangye, the only survivor in the super custom is admitted at the Islamic clinic in Jinja. He said the accident occurred when the truck driver who was driving ahead, slowed down abruptly to negotiate a hump. The speeding trailer from the back hit the super custom squeezing it between the two trucks. Mwerangye, a brother to Captain Peter Musherure of the Uganda Peoples Defence Forces, said the super custom had six passengers. It is so disgusting the rubbish from the UTODA. This is how low Uganda has ssank. UTODA management cannot have any courtesy when dealing with the owner of the parks they are tendering. They don't even get ashamed to shout out so much when they have been know to default simply because they have god fathers. We are fed up with leadership in this country taking us back to the stone age. Can you imagine the wealth the UTODA managers have as we go through a kraal like taxi park when it rains. Enough is enough. If NRM cannot manage the affairs of this country in a decent way, the best is pack and go. The taxi parks should be tendered out openly stipulating the standards expected. There should be NO default on revenue. That type of silly management is not the computer age. It is sad going through the taxi parks when it has rained and you have to look to a shoe shiner. Whoever is scheming for UTODA, if these guys are to keep in business the taxi business MUST be professionally run. And someone must tell UTODa that we are nor aware when they bought the parks which they seem to take as personal property. The taxi body alleges that their contract to operate in the city runs up to October 2014. Uganda Taxi Operators and Drivers Association Ltd (Utoda) yesterday went to court seeking an interim order stopping Kampala Capital City Authority (KCCA) from taking over the management of public transport. The move comes a week after KCCA announced that it will directly start managing public transport in the city next month when its contract with Utoda expires. The order is intended to allow the taxi body maintain its status quo until their main application before the same court is heard and determined. In their application filed before High Court in Kampala last week, Utoda argues that it is unfair for KCCA to take over the operation of the taxis in the city since their contract still runs up to October 2014. The application for an interim injunction is expected to be heard before one of the Kampala High Court registrars, Isaac Muwata today. “An interim order restraines respondents, their agents from interfering with the applicant’s management of taxi operations in the city due to expire in October 2014 pending the determination of the main miscellaneous cause,” reads part of the notice of motion by Utoda. The respondents in this case are KCCA and its Executive Director Jennifer Musisi Ssemakula. The friction between Utoda and KCCA arose on October 18 this year when the latter in its memorandum addressed to among others the Lord Mayor Erias Lukwago and the division councillors erroneously announced that the taxi operators’ contract was expiring at the end of the month. It is not clear how Bank of Uganda monitors mobile money transaction, but if this are not properly monitors, they are a possible cause of destabilizing the financial situation in the country. Those concerned need to do something. It is not clear where this Singh man came from. A man from nowhere with good evidence by himself that he lost a lot of money to voter bribing and hence wanted to use that to secure the Parliament seat at all cost. Kasibante has gone through a lot of trial courtesy of the NRM which long ago lost credibility and resolved to use voter bribing given the badly impoverished citizenry they have created. What Kasibante is going through and making his swearing a problem is just part of the trials Ugandans have to go through to see that a regime which is more of a liability is exposed. There is all the hope that the voters will get the right person they voted for into the Parliament and not an impostor. The High Court in Kampala, has declared Moses Kasibante the duly elected member of Parliament for Rubaga North saying he was the rightfully elected member of constituency. In a judgement which lasted more than one and a half hours, High Court Judge Justice Kibuuka Musoke faulted the Mengo Chief Magistrate for issuing a vote re-count order and abdicating the re-count process to a third party which should not have been the case as stipulated by the Parliamentary and Presidential Elections Act which led to the mess that followed the process later. The ruling brings to an end Mr. Katongole Singh's brief parliamentary career that saw him make a submission during the heated oil agreements debate in the house in support of the NRM party. What makes the new Rubaga North MP so powerful? 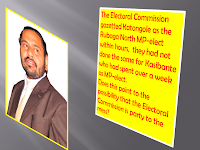 The new Rubaga North MP, Parminder Singh Katongole, has imprinted himself on the politics of Uganda in an interesting fashion. In a space of three months, he got the Electoral Commission to implement a vote recount against a court order and gazette him speedily; the recount, later declared ‘of no consequence’ by Judiciary spokesperson Erias Kisawuzi, took place within the precincts of Buganda Road Court; and Parliament brought forward his swearing-in by a day, catching his opponents off guard. Those events and others have got people asking what makes Singh so powerful. Asking the diminutive Ugandan of Indian extraction, who spots a ponytail, will not reveal much. He will smile at you, speak to you in Luganda if you like, or English with equal ease. Those who claim to know him will tell you he is tough and easily irritable. NRM insiders say he is “an asset” to the ruling party as a fundraiser, mainly from the powerful Asian community of traders, industrialists, and large commercial farmers. A businessman himself, with interests in the popular big concert venue, Kati Kati Restaurant, and Catnkar Limited, a fuel and transport company, he melds well at the class and ethnic interest levels. Within the party, however, he also keeps the right company. NRM insiders say Katongole works closely with the powerful party secretary general and newly appointed Prime Minister, Amama Mbabazi. In the last election, for example, as the party’s deputy treasurer, he was in charge of all money for campaign activities. It is not for nothing that party mobilisers at Kyaddondo road call him ‘Uncle Money’, an image he maintained in Rubaga North as he campaigned to enter Parliament. He printed huge campaign posters, dished out money to youth, women and other groups and individuals and donated an ambulance van to the constituency with his campaign picture imprinted on it. But such power can only carry you up to a point. When his swearing was brought forward by a day to May 16, acrimony erupted because back in the contested constituency, Rubaga North, his challenger Moses Kasibante was engaged in running battles with the police as he tried to stage a protest against Katongole’s swearing in. Kasibante was originally declared winner of the Feb. 18 election with 24,054 against Singh’s18,595 but a misty vote recount over a week later reversed the verdict, giving Singh 24,802 votes against Kasibante’s 22,850. The recount, which went on into the dead of the night on Feb. 28, proceeded under tight security, oblivious of the High Court order stopping it. Katongole had secured an order for recount from Mengo Chief Magistrate’s Court claiming that results from some polling stations had not been tallied. Kasibante successfully challenged the order, citing among other reasons, that some of the ballot boxes presented for the recount were not properly sealed. But the recount continued because the Electoral Commission officials doing the job argued that the High Court order arrived ‘too late’ when the recount had already started. 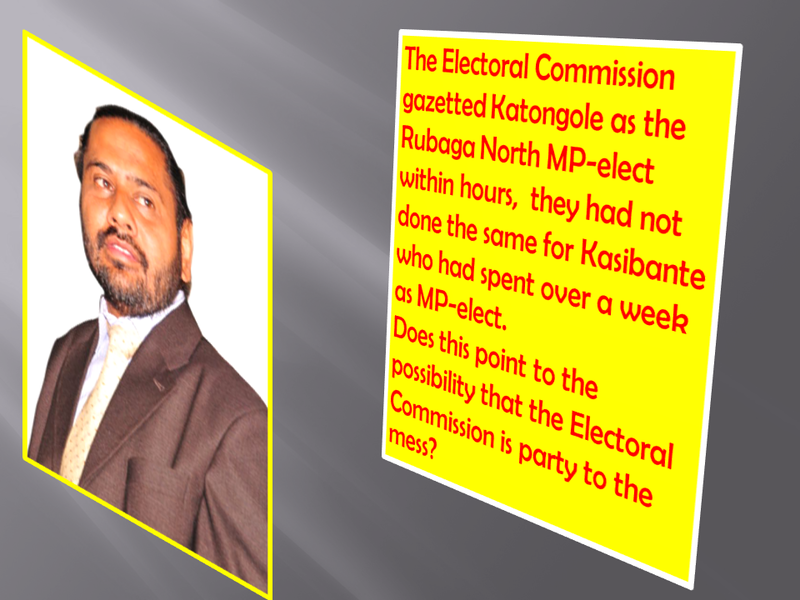 The Electoral Commission gazetted Katongole as the Rubaga North MP-elect within hours, even if they had not done the same for Kasibante who had spent over a week as MP-elect. Kisawuzi denounced the recount, saying the lower court had defied a High Court order. In the High Court, Kasibante’s lawyer, Erias Lukwago, added to the controversy by submitting that the Electoral Commission flouted the law by gazetting Katongole without a certificate of recount from the Mengo Chief Magistrate Phillip Odoki who was supposed to have supervised the recount. But Kasibante was confronted by a powerful legal team extracted from Akampumuza and Company Advocates, Mugenyi and Company Advocates, and Mwesigwa Rukutana and Company Advocates. Singh’s lawyers resorted to what Kasibante’s lawyers call delaying tactics, asking the High Court to refer the case to the Constitutional Court for interpretation. Judge Vincent Zehukirize saw no reason to refer the case to the Constitutional Court. He ruled that the matter Singh wanted to refer to the higher court, that he had been racially abused, was not part of the issues to be determined. But Katongole appealed the ruling, in the process delaying the hearing of the main suit. He was eventually sworn in before the suit was disposed of. The main case will now be heard between June 13 and 17 but observers say that even if Kasibante wins it, he would still have a lot of time to wait since Singh has the option of appealing to the Court of Appeal and again to the Supreme Court. The process could take years. Katongole may have imprinted his name on Uganda’s politics as a politician who gets his way regardless, but the same tag has sparked grumbling from unusual quarters; his colleagues in parliament. On his maiden showing on the floor of Parliament, Katongole was greeted with sarcastic applause and boos from his colleagues. Fluke, fluke, shouted Mukono Municipality MP Betty Nambooze, who is among those who maintain that the genuine winner of the constituency was her colleague, DP-leaning independent candidate Moses Kasibante. But Katongole remained unfazed. Speaker vows to reject attempts by ruling party caucus to overturn decisions of Parliament regarding oil agreements and ministers accused of receiving bribes. Speaker Rebecca Kadaga yesterday said political party caucus decisions cannot challenge resolutions of the House, shutting the door on attempts by the leadership of the ruling party to engineer a reversal on positions recently agreed on the oil sector. She said as Speaker and head of the Legislature, she still stands by the resolutions made by the House during its special session on the sector two weeks ago. Among the more contentious of the resolutions was that all ministers named in an alleged billion shilling oil bribery scam to step aside while Parliament investigates the matter, and for government to cease transacting in the sector from until necessary laws have been passed to give effect to the National Oil and Gas Policy for purposes of enhancing transparency and accountability. “I have been telling people that I don’t accept what comes out of party caucuses otherwise I would be obliged to go and attend DP press conferences, UPC press conferences, and others. Parliament is Parliament and the decisions it makes are final,” she said. Ms Kadaga, who was meeting a delegation of women leaders from South Sudan, had earlier met a section of MPs both NRM and independents. MPs Wilfred Niwagaba, Theodore Ssekikubo, Barnabas Tinkasiimire, Mariam Nalubega, Mohammed Nsereko and Cerinah Nebanda said they met Ms Kadaga about disagreements with some of their colleagues over the oil debate. “Our concern was to tell her that when the controversial issue comes back to Parliament for discussion, we will not rescind our earlier position. She also agreed that she has nothing to do with whatever takes place in party caucuses,” Mr Tinkasiimire said of the meeting. A 10-point resolutions motion, upheld by majority legislators through voice-voting during a special session on the oil sector two weeks ago, has now pitted the President against some of his party members with his alleged demands that the resolutions be revised. The NRM, which enjoys a supreme majority in Parliament, just returned from a retreat at the National Leadership Institute, Kyankwanzi, where Mr Museveni’s sentiments were discussed, and saw some MPs walking out on him in disagreement. The legislators have since revealed a plot to move a motion to adopt roll-call voting instead of the voice-voting, as part of an alleged plan to ‘blackmail’ MPs into siding with Mr Museveni. “We will vote to uphold the resolutions of Parliament, which we took because they are good resolutions. The President promised to dismiss us from the party but we represent our people who sent us to Parliament and not him,” Mr Tinkasiimire said. “In principle we feel we cannot proceed with them because the caucus has turned itself into the Parliament of Uganda and there is a process to oust the resolutions of Parliament,” said Mr Ssekikubo. Organizations involved in the corruption war in Uganda are the only solution to the scavengers that are turning Uganda broke and inducing abject poverty to our people. We must stop this business of just talking about thieves as they accumulate at the expense of Ugandans and posterity. The way forward is for organizations involved in the anti corruption crusade to raise money from all possible sources and advertise to pay handsomely whoever can give concrete information leading to exposure of those who are looting the country. This will help to get information as it is a fact that the deals which lead the country broke are undertaken with the knowledge of many people who if given incentives may easily give details of the information so that recoveries are made or a record is kept so that recoveries are done at the appropriate time if the NRM Government is reluctant to see recoveries made. Most lawmakers baying for the blood of ministers who allegedly pocketed billions of shillings as kickbacks, and demanding their resignation, have dramatically made a u-turn and are planning to rescind decisions they took on the floor of Parliament during the explosive debate. Uganda’s Parliament, on October 12, unanimously voted to have Prime Minister Amama Mbabazi, foreign affairs minister Sam Kutesa and internal affairs minister Hillary Onek step down and give way for an ad hoc committee to investigate allegations of bribery against them. “Enough is enough on corruption; there is no smoke without fire. I don’t see any problem in resigning a job once you’re suspected. The President can send them on leave to give way for investigations,” Gen Elly Tumwine, an army representative and close confidant to the President, argued then. The resolution was one of the ten for which MPs voted after two days of heated debate. 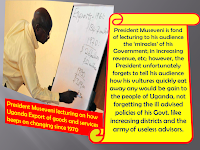 But how did intense lobbying and President Museveni’s charm offensive at the National Leadership Institute Kyankwanzi put out a fire that nearly gutted the chambers of Parliament? According to sources that attended the Kyankwanzi retreat, Museveni used political nous and isolation, and was even cunning enough to win over the hearts of the majority of lawmakers who only a fortnight ago seemed they would not budge on the resolutions they had agreed upon. Aware that it would be difficult to sell his message across the spectrum, Museveni began by isolating a group of lawmakers who have historically refused to budge and accept government positions during controversy. Sources told The Observer that Museveni on Friday morning took to the floor after acting Chief Whip David Bahati. Bahati had initially attempted to debate the NRM performance in the last presidential election, but Museveni immediately commenced debate on the ten resolutions the House had adopted during the oil debate. But before debating the details of the resolutions, Museveni went on the offensive, asking why rabble-rousers Muhammad Nsereko (Kampala Central), Theodore Ssekikubo (Lwemiyaga) and Wilfred Niwagaba (Ndorwa East) “were mobilizing people not to attend the retreat”. Niwagaba then asked: “Whoever I mobilized not to attend, please stand up”; and without any response, the accusation lost legitimacy. Ssekikubo also denied preaching any sentiment against the retreat. But the Mbarara municipality lawmaker, Medard Bitekyerezo, said he had listened to a radio programme where Nsereko said he would not attend the retreat — although he failed to name the radio station in question. Nsereko was not done either: “This is what I believe in, and it’s my opinion and conscience,” he said, his voice nearly drowned by the howls of those heckling him, shortly before Museveni called for a lunch break. Museveni, while debating the first Parliamentary resolution — which demanded that a moratorium on executing oil contracts and transactions be placed on the government until the necessary laws are passed — said this is unacceptable because the government would lose revenue. He said if the government adopted such a radical position, it would lose a lot of money, including the country’s $404m tax claim from the $1.45bn sale of Heritage’s stakes in two oil blocks to Tullow Oil Plc. An arbitration process is underway in London. “If this money is refunded, it could be used to build Karuma dam,” Museveni said. The President, who had asked the deputy Attorney General Fred Ruhindi to complement his arguments, said the moratorium would also affect revenue collection from the sale of three exploration blocks to Total SA and China National Offshore Oil Corporation (CNOOC) Ltd, bought from Tullow at $2.9bn. However, sources told The Observer that Niwagaba, a lawyer, articulately explained why the moratorium would neither impact on revenue collection nor affect the reward of the $404m tax dispute. But many MPs agreed with Museveni, saying they would rescind the decision to place a moratorium in the oil industry. However, a few lawmakers who had rejected this position quietly left the venue at about 7pm and have since not returned to Kyankwanzi. They include Dr Chris Baryomunsi, Cerinah Nebanda, Ssekikubo, Nsereko and Niwagaba. Museveni had warned lawmakers not to be sucked into such flawed debates as the allegations of bribery, which are mere proxy wars within the NRM party. “Baryomunsi is fighting Mbabazi’s wife, while Niwagaba is fighting battles on behalf of Father Gaetano [Tibanyenda] against Hope Mwesigye [former Agriculture minister and sister-in-law to Mbabazi],” he said. Museveni, in a thinly veiled statement, revealed that Fr Tibanyenda tried to get close to Mwesigye, in vain. “Ssekikubo is fighting Kutesa,” he added. However, Museveni said the position to rescind the resolution should remain within the confines of the NRM and in Kyankwanzi, and should not be misinterpreted. “We don’t need to go to Parliament and people say, ‘the Sabalwanyi (chief fighter) is fighting [Speaker Rebecca] Kadaga and Parliament,” he argued. Sources reveal that although Museveni courted lawmakers through an impassioned plea, Mbabazi also quietly marshaled support using regional caucuses. Sources say Sembabule Woman MP Anifa Kawooya, a close associate of Mbabazi, almost traded blows with the Wakiso and Butaleja Woman MPs, Rosemary Sseninde and Nebanda, respectively, who insist that the ministers should step aside before the parliamentary committee begins investigations into the oil bribery allegations. Mbabazi also relied on Yona Musinguzi (the Ntungamo municipality), Gabriel Ajedra (Arua Municipality), David Muhumuza (Mwenge North), Judith Amoit (Pallisa Woman) and the state minister for Regional Cooperation, Asuman Kiyingi, to roundly defeat the resolutions that particularly call for his resignation. Prior to the retreat, a majority of NRM lawmakers were defiant, demanding the resignation or censure of ministers who allegedly received kickbacks from Tullow Oil. Buyaga East County MP Ignatius Besisira, who was vocal on the floor and demanded the resignation of those implicated, has since changed position. When The Observer contacted him on Friday, he declined to comment on his change of heart. Several MPs had earlier vowed not to be swayed by President Museveni. “The Kyankwanzi retreat is all about interaction, and as a President, he should respect our conscience as MPs, lest we invoke other means if he is being contemptuous of Parliament and the Constitution,” Baryomunsi told The Observer prior to the retreat. Peter Okeyoh (Bukooli Islands) shared this sentiment, saying the MPs would resist any attempts to be whipped. “They can do whatever they want to do; for us we shall just wait for them in Parliament. This is not a party issue; we should put the national issues ahead of our political parties,” said Felix Okot Ogong (Dokolo), who was away in Nairobi on Friday. EMBARGOED: Not for news wire transmission, posting on Web sites, or any other media use until Thursday, October 20, 2011, 00:01 GMT, which is Wednesday, October 19, 08:01 PM in Washington D.C.
Angola made transferring property less costly by reducing transfer taxes. It also strengthened its credit information system, by adopting new rules for credit bureaus and guaranteeing the right of borrowers to inspect their data. Benin made it easier to start a business and strengthened access to credit by implementing amendments to the OHADA (Organization for the Harmonization of Business Law in Africa) Uniform Acts. The amendments to the Uniform Act on General Commercial Law replaced the requirement for a copy of the criminal records of a company’s founders with one for a sworn declaration at the time of the company’s registration. The amendments to the Uniform Act on Secured Transactions broaden the range of assets that can be used as collateral (including future assets), extend the security interest to the proceeds of the original asset, and introduce the possibility of out-of-court enforcement. Burkina Faso made it easier to start a business and strengthened access to credit by implementing amendments to the OHADA (Organization for the Harmonization of Business Law in Africa) Uniform Acts. The amendments to the Uniform Act on General Commercial Law replaced the requirement for a copy of the criminal records of a company’s founders with one for a sworn declaration at the time of the company’s registration. The amendments to the Uniform Act on Secured Transactions broaden the range of assets that can be used as collateral (including future assets), extend the security interest to the proceeds of the original asset, and introduce the possibility of out-of-court enforcement. Burkina Faso made dealing with construction permits less costly by reducing the fees to obtain a fire safety study. Burundi made dealing with construction permits easier by reducing the cost to obtain a geotechnical study, made paying taxes easier for companies by reducing the payment frequency for social security contributions from monthly to quarterly, and made resolving insolvency easier by amending its commercial code to establish foreclosure procedures. In addition, Burundi strengthened investor protections by introducing new requirements for the approval of transactions between interested parties, by requiring greater corporate disclosure to the board of directors and in the annual report, and by making it easier to sue directors in cases of prejudicial transactions between interested parties. Cameroon made it easier to start a business and strengthened access to credit by implementing amendments to the OHADA (Organization for the Harmonization of Business Law in Africa) Uniform Acts. The amendments to the Uniform Act on General Commercial Law replaced the requirement for a copy of the criminal records of a company’s founders with one for a sworn declaration at the time of the company’s registration. The amendments to the Uniform Act on Secured Transactions broaden the range of assets that can be used as collateral (including future assets), extend the security interest to the proceeds of the original asset, and introduce the possibility of out-of-court enforcement. Cape Verde made registering property faster by implementing time limits for the notaries and the land registry. It improved its credit information system by introducing a new online platform and by starting to provide five years of historical data. And it made resolving insolvency easier by introducing qualification requirements for insolvency administrators and a shorter time frame for liquidation proceedings. The Central African Republic made it easier to start a business and strengthened access to credit by implementing amendments to the OHADA (Organization for the Harmonization of Business Law in Africa) Uniform Acts. The amendments to the Uniform Act on General Commercial Law replaced the requirement for a copy of the criminal records of a company’s founders with one for a sworn declaration at the time of the company’s registration. The amendments to the Uniform Act on Secured Transactions broaden the range of assets that can be used as collateral (including future assets), extend the security interest to the proceeds of the original asset, and introduce the possibility of out-of-court enforcement. The Central African Republic further eased the process of starting a business by reducing business registration fees. And it made registering property easier by cutting the cost in half. Chad made it easier to start a business and strengthened access to credit by implementing amendments to the OHADA (Organization for the Harmonization of Business Law in Africa) Uniform Acts. The amendments to the Uniform Act on General Commercial Law replaced the requirement for a copy of the criminal records of a company’s founders with one for a sworn declaration at the time of the company’s registration. The amendments to the Uniform Act on Secured Transactions broaden the range of assets that can be used as collateral (including future assets), extend the security interest to the proceeds of the original asset, and introduce the possibility of out-of-court enforcement. Chad further eased the process of starting a business by eliminating the requirement for a medical certificate. The Comoros strengthened access to credit by implementing amendments to the OHADA (Organization for the Harmonization of Business Law in Africa) Uniform Act on Secured Transactions that broaden the range of assets that can be used as collateral (including future assets), extend the security interest to the proceeds of the original asset, and introduce the possibility of out-of-court enforcement. The Democratic Republic of Congo reduced the administrative costs of obtaining a construction permit, made paying taxes easier for firms by replacing the sales tax with a value added tax, and made business start-up faster by reducing the time required to complete company registration and obtain a national identification number. The Republic of Congo strengthened access to credit by implementing amendments to the OHADA (Organization for the Harmonization of Business Law in Africa) Uniform Act on Secured Transactions that broaden the range of assets that can be used as collateral (including future assets), extend the security interest to the proceeds of the original asset, and introduce the possibility of out-of-court enforcement. The Republic of Congo made registering property more expensive, however, by reversing a previous law that had reduced the registration fee. Côte d’Ivoire made it easier to start a business by reorganizing the court clerk’s office where entrepreneurs file their company documents. In addition, it eliminated a tax on firms—the contribution for national reconstruction (contribution pour la reconstruction nationale). Côte d’Ivoire also strengthened access to credit, by implementing amendments to the OHADA (Organization for the Harmonization of Business Law in Africa) Uniform Act on Secured Transactions that broaden the range of assets that can be used as collateral (including future assets), extend the security interest to the proceeds of the original asset, and introduce the possibility of out-of-court enforcement. Equatorial Guinea strengthened access to credit by implementing amendments to the OHADA (Organization for the Harmonization of Business Law in Africa) Uniform Act on Secured Transactions that broaden the range of assets that can be used as collateral (including future assets), extend the security interest to the proceeds of the original asset, and introduce the possibility of out-of-court enforcement. In Ethiopia delays in providing new connections made getting electricity more difficult. Gabon strengthened access to credit by implementing amendments to the OHADA (Organization for the Harmonization of Business Law in Africa) Uniform Act on Secured Transactions that broaden the range of assets that can be used as collateral (including future assets), extend the security interest to the proceeds of the original asset, and introduce the possibility of out-of-court enforcement. The Gambia made getting electricity faster by allowing customers to choose private contractors to carry out the external connection works. In addition, it reduced the minimum turnover tax and corporate income tax rates. And it made trading across borders faster by implementing the Automated System for Customs Data (ASYCUDA). Ghana increased the cost to start a business by 70 percent. Guinea strengthened access to credit by implementing amendments to the OHADA (Organization for the Harmonization of Business Law in Africa) Uniform Act on Secured Transactions that broaden the range of assets that can be used as collateral (including future assets), extend the security interest to the proceeds of the original asset, and introduce the possibility of out-of-court enforcement. Guinea-Bissau made it easier to start a business and strengthened access to credit by implementing amendments to the OHADA (Organization for the Harmonization of Business Law in Africa) Uniform Acts. The amendments to the Uniform Act on General Commercial Law replaced the requirement for a copy of the criminal records of a company’s founders with one for a sworn declaration at the time of the company’s registration. The amendments to the Uniform Act on Secured Transactions broaden the range of assets that can be used as collateral (including future assets), extend the security interest to the proceeds of the original asset, and introduce the possibility of out-of-court enforcement. Kenya introduced a case management system that will help increase the efficiency and cost-effectiveness of commercial dispute resolution. Lesotho made enforcing contracts easier by launching a specialized commercial court. Liberia made starting a business easier by introducing a one-stop shop. It strengthened its legal framework for secured transactions by adopting a new commercial code that broadens the range of assets that can be used as collateral (including future assets) and extends the security interest to the proceeds of the original asset. And Liberia made trading across borders faster by implementing online submission of customs forms and enhancing risk-based inspections. Madagascar made starting a business easier by eliminating the paid-in minimum capital requirement—but also made it more difficult by introducing a new requirement for tax registration before company incorporation. Madagascar improved its credit information system by eliminating the minimum threshold for loans included in the database and making it mandatory for banks to share credit information with the credit bureau. Malawi improved its credit information system by passing a new law allowing the creation of a private credit bureau. And it made resolving insolvency easier by adopting new rules providing clear procedural requirements and time frames for winding up a company. But property registration became slower because the previous year’s improvement in the time for processing compliance certificates at the Ministry of Lands was not sustained. Mali made starting a business easier by adding to the services provided by the one-stop shop. In addition, it strengthened access to credit by implementing amendments to the OHADA (Organization for the Harmonization of Business Law in Africa) Uniform Act on Secured Transactions that broaden the range of assets that can be used as collateral (including future assets), extend the security interest to the proceeds of the original asset, and introduce the possibility of out-of-court enforcement. Mauritania made dealing with construction permits easier by opening a one-stop shop. Mozambique made getting electricity more difficult by requiring authorization of a connection project by the Ministry of Energy and by adding an inspection of the completed external works. Namibia adopted a new company law that established clear procedures for liquidation. But it made transferring property more expensive for companies. Niger strengthened access to credit by implementing amendments to the OHADA (Organization for the Harmonization of Business Law in Africa) Uniform Act on Secured Transactions that broaden the range of assets that can be used as collateral (including future assets), extend the security interest to the proceeds of the original asset, and introduce the possibility of out-of-court enforcement. Rwanda made starting a business easier by reducing the business registration fees. And it eased firms’ administrative burden of paying taxes by reducing the frequency of value added tax filings from monthly to quarterly. Rwanda’s credit information system improved, as its private credit bureau started to collect and distribute information from utility companies and also started to distribute more than 2 years of historical information. Rwanda made transferring property more expensive, however, by enforcing the checking of the capital gains tax. São Tomé and Príncipe made starting a business easier by establishing a one-stop shop, eliminating the requirement for an operating license for general commercial companies, and simplifying publication requirements. It made dealing with construction permits easier by reducing the time required to process building permit applications, and it made registering property less costly by lowering property transfer taxes. In addition, São Tomé and Príncipe made trading across borders faster by adopting legislative, administrative, and technological improvements. Senegal made it easier to start a business and strengthened access to credit by implementing amendments to the OHADA (Organization for the Harmonization of Business Law in Africa) Uniform Acts. The amendments to the Uniform Act on General Commercial Law replaced the requirement for a copy of the criminal records of a company’s founders with one for a sworn declaration at the time of the company’s registration. The amendments to the Uniform Act on Secured Transactions broaden the range of assets that can be used as collateral (including future assets), extend the security interest to the proceeds of the original asset, and introduce the possibility of out-of-court enforcement. In addition, Senegal made trading across borders less costly by opening the market for transport, which increased competition. And it made enforcing contracts easier by launching specialized commercial chambers in the court. The Seychelles made paying taxes less costly for firms by eliminating the social security tax. In addition, it made trading across borders faster by introducing electronic submission of customs documents. But an expansion of the jurisdiction of the lower court increased the time required to enforce contracts. Sierra Leone improved its credit information system by enacting a new law providing for the creation of a public credit registry. It made enforcing contracts easier by launching a fast-track commercial court, and it made trading across borders faster by implementing the Automated System for Customs Data (ASYCUDA). Sierra Leone made resolving insolvency easier by establishing a fast-track commercial court in an effort to expedite commercial cases, including insolvency proceedings. South Africa made starting a business easier by implementing its new company law, which eliminated the requirement to reserve a company name and simplified the incorporation documents. It made transferring property less costly and more efficient by reducing the transfer duty and introducing electronic filing. And South Africa made resolving insolvency easier by introducing a new reorganization process to facilitate the rehabilitation of financially distressed companies. Swaziland made transferring property quicker by streamlining the process at the land registry. Tanzania made trading across borders faster by implementing the Pre-Arrival Declaration (PAD) system and electronic submission of customs declarations. Togo strengthened access to credit by implementing amendments to the OHADA (Organization for the Harmonization of Business Law in Africa) Uniform Act on Secured Transactions that broaden the range of assets that can be used as collateral (including future assets), extend the security interest to the proceeds of the original asset, and introduce the possibility of out-of-court enforcement. Togo also reduced its corporate income tax rate. Uganda increased the efficiency of property transfers by establishing performance standards and recruiting more officials at the land office. In addition, Uganda introduced changes that slowed business start-up by adding time to the process of obtaining a business license—though it also simplified registration for a tax identification number and for value added tax by introducing an online system. Zambia made registering property more costly by increasing the property transfer tax rate. For more information about the Doing Business report series, please visit www.doingbusiness.org. Join us on Facebook: http://www.facebook.com/DoingBusiness.org. The MPs who left Kyankwanzi are the epitome of a new Uganda. We are fed up of a country constantly drifting to stone age times simply because of selfish interests who don't have any shame when the economy is messed up, everything is upside down, but they enjoy with their families. In an unprecedented response to what they called “a sinister plot to hijack the independence of Parliament and entrench corruption in the oil sector”, a group of legislators yesterday walked out on President Museveni at the party’s stormy Kyankwanzi retreat. Those who witnessed this drama, told Sunday Monitor that the trouble began after the President proposed that the NRM Caucus resolve to overturn the Parliament resolutions on oil that placed a moratorium on executing oil contracts and oil transactions on the Executive until the necessary laws have been passed by Parliament. When the President refused to budge, the retreat that had started on a lighter note, proposing ways on how to fix the strained economy later turned riotous with ministers led by Henry Banyenzaki (State Economic Monitoring) and other members from the Movement Secretariat heckling whoever attempted to oppose the President. While Mr Museveni defended his ministers accused of being corrupt, some MPs were accused of conniving with the opposition to paralyse government using the oil debate. In a heated exchange between the NRM Chairman and Mr Ssekikubo, as others banked, tabled and heckled, the President was tasked to explain whether by going back to the bush he will be seeking to “overthrow himself”. As debate raged on, Prime Minister Amama Mbabazi reportedly proposed that MPs return to House with a motion to annul what Parliament had agreed upon. But the President rejected this and instead asked the caucus to give him powers to sign new Production Sharing Agreements; a move Parliament stopped until oil laws are enacted. “The President wanted to arm-twist us but we rejected that proposal in public interest and we broke ranks. We told him that the NRM Caucus is not Parliament but he refused. When we saw that some of our members were conniving with the President to hijack the independence of Parliament we walked out and we don’t have any regrets to make,” Mr Ssekikubo said. Other MPs who walked out of the President are; Dr Chris Baryomunsi, Muhammad Nsereko, Wilfred Niwagaba, Henry Musasizi, Cerinah Nebanda and Barnabas Tinkasiimire. 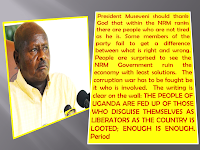 In 2006, President Yoweri Museveni announced a policy of zero-tolerance for corruption. However, at the beginning of Musevini’s third term following the first multi-party (but not entirely fair) elections, most governance indicators show that corruption is perceived as widespread and endemic at all levels of society. Global Integrity’s 2006 report on the country estimates that more than half the government’s annual budget is lost to corruption each year, amounting to USD 950 million. Corruption scandals involving personalities close to those in power periodically hit the headlines. A former health minister and loyal supporter of the president, along with two deputies, have been charged with misappropriating USD 2 million from funds provided by the Global Alliance for Vaccine and Immunization (GAVI) in 2005. More recently, in 2007, the government circumvented official procurement guidelines to contract an unknown company, Kenlloyd Logistics, to replenish Uganda’s fuel reserves. The company was being run by the sonin-law of the foreign minister, who is himself related to the president. Public confidence in government officials is severely affected by such scandals. A majority of citizens surveyed for the 2005 Afro barometer perceived corruption to be rampant. In addition, 36% of respondents to the survey believed that most or all government officials - whether at the central or at the local level - were involved in corruption. (http://www.afrobarometer.org/uganda.htm). Other empirical data corroborates this. The 2008 Corruption Perceptions Index (CPI) ranks Uganda at 126th place with a score of 2.6. Previous iterations of the index show that, despite slight improvements, the various sources of the CPI continue to perceive corruption as rampant and systemic in Uganda, with scores ranging from 2.1 to 2.8 between 2002 and 2007. (Please see: http://transparency.org/policy_research/surveys_indices/cpi/2008). The World Bank’s 2007 Worldwide Governance Indicators note that Uganda performed moderately in terms of regulatory quality (48.5) and government effectiveness (42.7), below average in terms of rule of law (37.6), and voice and accountability (33.2) and weakly in terms of control of corruption (24.6 compared to 26.2 in 2003) and political stability (13.9). (Please see: http://info.worldbank.org/governance/wgi2007/sc_chart.asp). ml).The World Bank Investment Climate Assessment undertaken in 2004, corroborates this finding with 46.3% of small firms and 56.5 % of middle size firms identifying corruption as a major or severe constraint to doing business in the country. 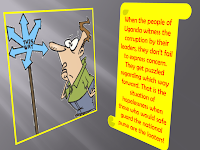 Bureaucratic and administrative forms of corruption are widespread in the Ugandan administration, with practices of bribery, nepotism, and misuse of official positions and resources. Government bureaucracy, complex regulatory procedures and red tape provide numerous opportunities for corruption and rent seeking. Political patronage and favouritism further characterize the Ugandan administration, with NRM patronage systems reaching into the private sector. In local government bodies, giving jobs and contracts to relatives or supporters appears to be common practice. A 2006 Freedom House report denounces widespread patronage and corruption in government, with the exception of the public, health and education service commissions that are generally credited with making open, merit-based appointments. Even here, however, there have been recent cases of interference in the appointment of senior officials in the ministries of health and of education and sports. private and public sources. During the 2004 elections, 35% of respondents to the Afro Barometer reported having been offered food or a gift in return for their vote. procurement accounts for 70% of public spending, of which an estimated 20% is lost via corruption. 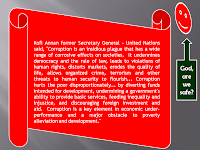 In June 2008, a senior World Bank official stated that high level corruption in procurement deals had been responsible for a loss of USD 300 million since 2005. He added that 70% of government contracts were not awarded according to established procedures, while half of the national budget is spent on procurement deals. (Please see the 2008 Global Integrity report: http://report.globalintegrity.org/Uganda/2008). The US-Department of State Investment Climate Statements for 2009 also notes that government procurement is not transparent, particularly for defence items. In previous years, several high-profile government tenders for infrastructure projects were suspended due to allegations of corruption. (http://www.state.gov/e/eeb/rls/othr/ics/2009/index.htm). (IGG) and USAID reports that illegal payments to secure government contract at both the local and the central levels are even higher, representing approximately 7 to 9% of the contract value. The survey further estimates that direct losses due to corruption in procurement - at both the central and the local levels – amounted to between USD 64-85 million in 2004-2005. The majority of respondents identified the secretary to the Tender Board and Tender Board members as being most corrupt. (http://www.ppda.go.ug/downloads/Integrity%20survey%20FINAL%20REPORT%202007.pdf). The PPDA, IGG and USAID survey identifies the lack of effective reporting systems, poor record management by state organs, the weakness of the judiciary, the poor investigation of corruption cases, and the lack of effective systems to punish corrupt officials, as majors factors contributing to the high prevalence of corruption in public procurement. indicates that 43% of firms report occasionally or always paying bribes to tax officers. 84% of respondents to the 2005 Afro Barometer believe that tax officials are involved in corruption. In 2003, five senior officers attached to the Large Taxpayer Department were involved in a major corruption scandal. A Commission of Inquiry of Corruption in the URA was appointed by the government in the same year due to serious allegations of underestimated or misstated declarations in customs, as well as collaboration between tax payers and URA staff. The Commission released a much delayed and debated report two years later whose legality was questioned by Members of Parliament. The report was ultimately nullified by the High Court. dropped following political pressure. Investigations of police corruption have increased under the leadership of a new police chief appointed in 2005. He has, however, faced internal criticism and has received several death threats. 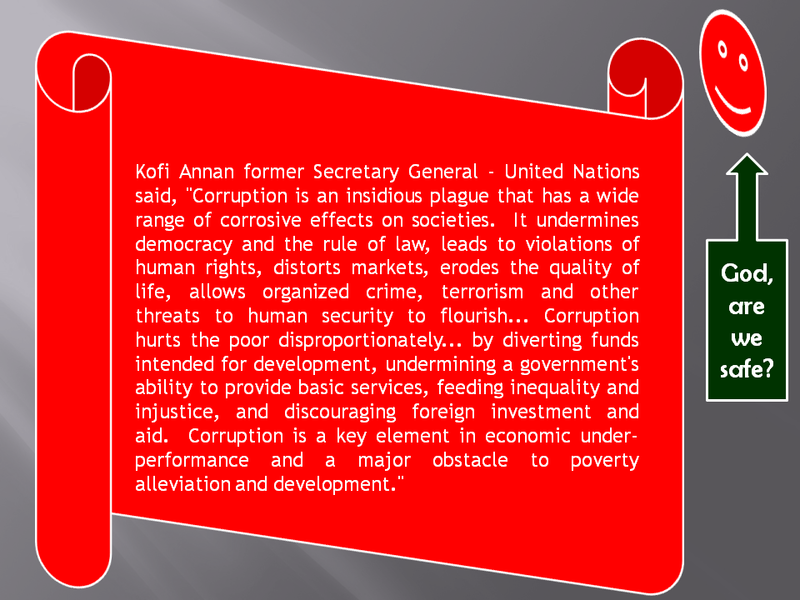 (http://www.business-anticorruption.com/en/country-profiles/sub-saharanafrica/uganda/background-information/). According to Freedom House 2006 and 2008, the executive does not guarantee the independence of the judiciary and there have been instances of intimidation of the judiciary. In 2005, heavily armed soldiers surrounded the High Court in an attempt to courtmartial civilians involved in allegations of treason. Concerns about judicial independence were reinforced by security forces’ intervention in a politically sensitive trial in 2007. Judges subsequently went on strike to protest against the invasion of the courts by security forces, and the East African Court of Justice found Uganda guilty of violating the rule of law and the rights of its citizens by allowing the military to repeatedly interfere with court processes. The Uganda Law Society noted that this episode reflected a broader problem of government officials refusing to comply with certain judicial actions. reveals that the upper levels of the judiciary demonstrate high standards of professionalism and independence. The administration of justice is undermined, however, by a lack of resources, skills and capacity at the lower levels of the judiciary. number of the companies surveyed for the 2006 Word Bank and IFC Enterprise Survey do not believe Uganda’s courts to be fair, impartial and uncorrupted. 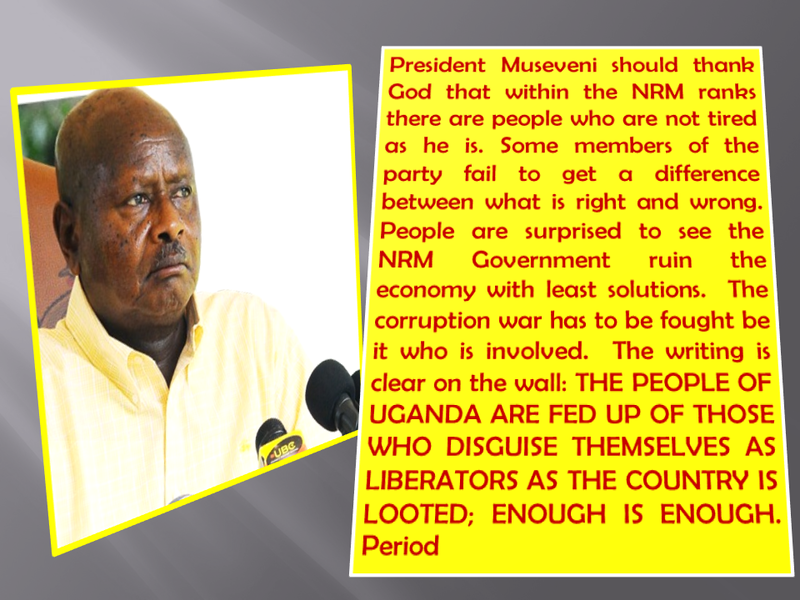 MUSEVENI REFUSED MINISTERS TO RESIGN! GOD; DOES UGANDA REALLY HAVE A FUTURE? 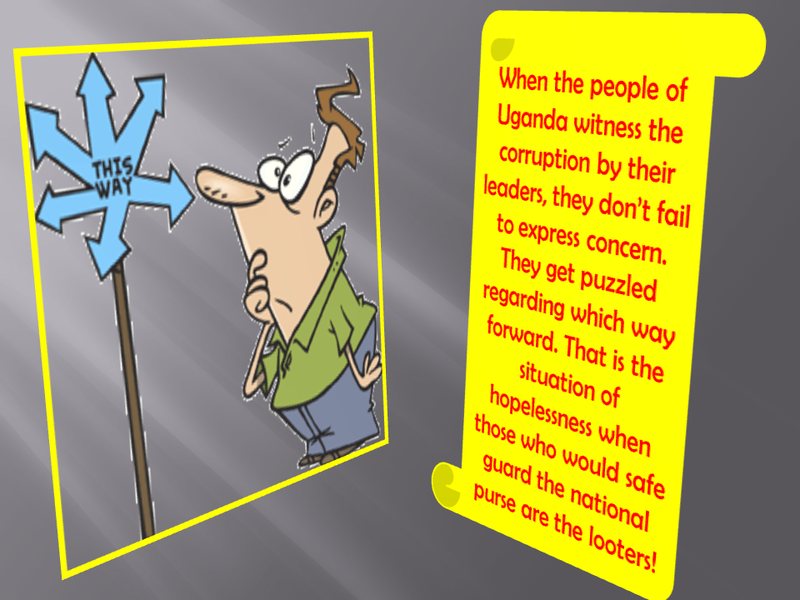 IS THERE ANY HOPE IN UGANDA GIVEN THE CORRUPTION?